Texas is a state located in the United States of America. 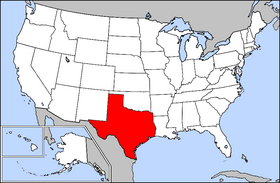 The 28th U.S. state, Texas joined the United States in 1845. Its postal abbreviation is TX. The state name derives from a word in a Caddoan language of the Hasinai, táysha? (or tejas, as the Spaniards spelled it), meaning friends or allies. Spanish explorers mistakenly applied the word to the people and their location. With an area of 696,241 km2 and a population of 22.5 million, Texas is the second largest U.S. state in both area and population, and the largest state in the contiguous 48 states in area. (Alaska is the largest U.S. state in area and California is the most populous.) Texas has historically had a "larger than life" reputation, especially in cowboy films. Texas lies in the south-central part of the United States of America. Texas is considered to form part of the US South and part of the U.S. Southwest. Some regions of Texas are associated with the Southwest more than the South, while other regions are associated with the South more than the Southwest. Texas shares some cultural elements with both regions, with more similarities with the South, especially Arkansas and Louisiana, in East Texas, and more similarities with the Southwest, especially Mexico and New Mexico, in West Texas and South Texas. Texas is the southernmost part of the Great Plains, which ends in the south against the folded Sierra Madre Oriental of Mexico. It is mostly sedimentary rocks, with east Texas underlain by a Cretaceous and younger sequence of sediments, the trace of ancient shorelines east and south until the active continental margin of the Gulf of Mexico is met. This sequence is built atop the subsided crest of the Appalachian Mountains–Ouachita Mountains–Marathon Mountains zone of Pennsylvanian continental collision, which collapsed when rifting in Jurassic time opened the Gulf. West from this orogenic crest, which is buried beneath the Dallas–Waco–Austin–San Antonio trend, the sediments are Permian and Triassic in age. Texas can claim that "Six Flags" have flown over its soil: the Fleur-de-lis of France, and the national flags of Spain, Mexico, the Republic of Texas, the United States of America and the Confederate States of America. Native American tribes that once lived inside the boundaries of present-day Texas include Apache, Atakapan, Bidai, Caddo, Comanche, Cherokee, Kiowa, Tonkawa, and Wichita. Currently, there are three federally recognized Native American tribes which reside in Texas: the Alabama-Coushatta Tribes of Texas, the Kickapoo Traditional Tribe of Texas, and the Ysleta Del Sur Pueblo of Texas. On November 6, 1528 shipwrecked Spanish conquistador Álvar Núñez Cabeza de Vaca became the first known European to set foot on Texas. A member of the Narváez expedition, he was later enslaved by a Native American tribe of the upper Gulf coast, and explored what are now the U.S. states of Texas, New Mexico and Arizona on foot from coastal Louisiana to Sinaloa, Mexico, over a period of roughly six years. He returned to Europe in 1537, where he wrote about his experiences in a work called La relación ("The Tale"). Austin is the capital of Texas. 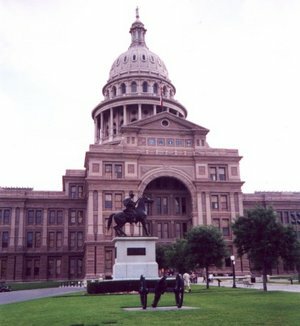 The State Capitol resembles the federal Capitol Building in Washington, DC, but is faced in pink granite and is topped by a statue of the "Goddess of Liberty" holding aloft a five-point Texas star. Like several other southern state capitols, it faces south instead of north. The capitol building is taller than the U.S. national capitol, but less massive. 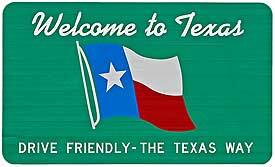 The people of Texas, historically often known as Texians, are now generally referred to as Texans. As of 2004, the state had a population of 22,490,022. The state has 3,450,500 foreign-born residents (15.6% of the state population), of which an estimated 1.2 million are illegal aliens (illegal aliens account for more than one-third of the foreign-born population in Texas and 5.4% of the total state population). The state's population grew 5.5 million between 1990 and 2004, a growth of 32.4%. Texas remained largely rural until World War II, with cattle ranching, oil, and agriculture as its main industries. Contrary to popular mythology, cattle ranching was never Texas's chief industry. Before the oil boom, back to the period of the first anglo settlers, this was cotton farming (as in most of the South). Texas has two global cities as Houston and Dallas hold the title of "Gamma World City" by the Globalization and World Cities Study Group & Network (GaWC). Ranked by population of cities (incorporated municipalities), the five largest cities in Texas are Houston, San Antonio, Dallas, Austin, and Fort Worth. Texas is the only state to have three cities with populations exceeding 1 million (California has two, no other state has more than one)--Houston, San Antonio, and Dallas, which are also among the 10 largest cities of the United States. Austin and Fort Worth are in the top 20 largest US cities. The public school systems are administered by the Texas Education Agency. All but one of the school districts in Texas are separate from any form of municipal government, hence they are called "independent school districts," or "ISD" for short. School districts may cross city and county boundaries. School districts have the power to tax their residents and to use eminent domain. The sole exception to this rule is Stafford Municipal School District, which serves all of the city of Stafford. Texas freeways have been heavily traveled since their 1948 beginnings with a several-mile stretch of Houston's Gulf Freeway, and are often under construction to meet the demands of continuing growth. As of 2005, there were 79,535 miles of public highway in Texas (up from 71,000 in 1984). Texas Department of Transportation (TxDOT) planners have sought ways to reduce rush hour congestion, primarily through High-occupancy vehicle (HOV) lanes for vans and carpools. The "Texas T", an innovation originally introduced in Houston, is a ramp design that allows vehicles in the HOV lane, which is usually the center lane, to exit directly to transit centers or to enter the freeway directly into the HOV lane without crossing multiple lanes of traffic. Timed freeway entrances, which regulate the addition of cars to the freeway, are also common. Houston and San Antonio have extensive networks of freeway cameras linked to transit control centers to monitor and study traffic. Through 2004, El Paso had a minor-league baseball team in the Texas League, the El Paso Diablos, but the club moved to Springfield, Missouri after that season and became known as the Springfield Cardinals. Four ships of the United States Navy have borne the name USS Texas in honor of the state. One state holiday, Juneteenth (from "June" + "Nineteenth," its date), commemorates the day in 1865 that the slaves in Texas learned of the Emancipation Proclamation. At 311 feet, Texas's capitol building in Austin is taller than the capitol building in Washington, D.C.